Pictured are members of the Winning Savills Team Nessa Keane; Anne Kiernan; Peter Dargan (Irish Times); Conor Steen and Gerry McCarthy. 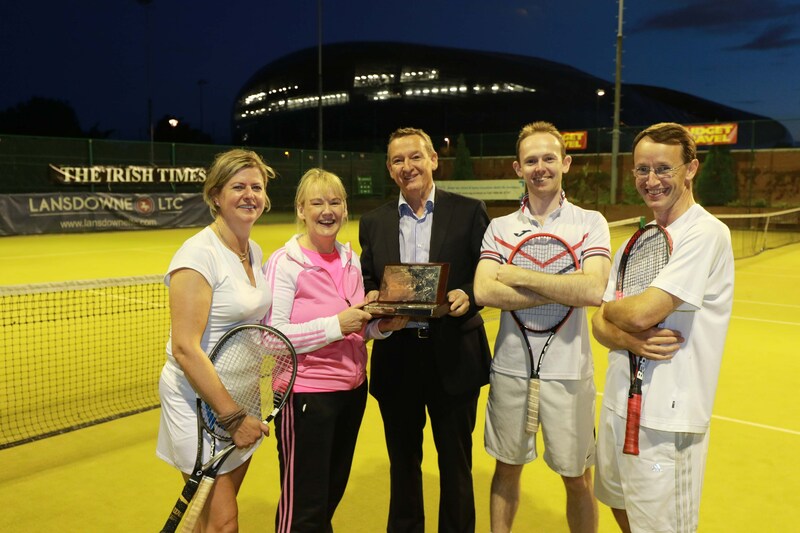 Twenty teams from all sub-sectors of the Irish property industry took part in the 2015 SCSI Irish Times Tennis Tournament, which was held last week in beautiful grounds of Lansdowne Lawn Tennis Club – which stands in the shadows of the amazing Aviva stadium. The competition, now in its 26th year, is growing from strength to strength with the standard of tennis getting stronger each year. The typical Irish summer of glorious sunshine interrupted by torrential rain did not deter players or supporters from turning out in their droves to enjoy the evening. The final was a repeat of last year, when at the semi-final stage Independent Valuations got the better of IPAV, and last year’s winners Savills fought off a brave challenge from The Law Society. Independent Valuations – seeking revenge for last year’s close defeat – sensed success, but Savills, with their mixture of youth and experience, emerged victorious for the third year in succession.